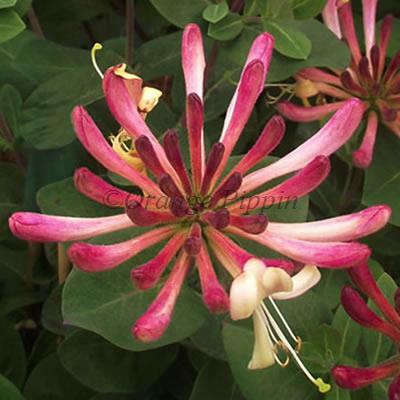 'Rhubarb and Custard' is a stunning, free-flowering, climbing Honeysuckle. It produces masses of dark purple / brown flower buds in early summer, which open out into a kaleidoscope of white, yellow, red and pink flowers, contrasting with the rich dark green foliage. Flowering continues for most of the summer, a good 10 weeks or more is not unusual. The flowers have a heavy scent which bees find irresistible. In autumn the flowers are followed by numerous bright red glossy berries. 'Rhubarb and Custard' was developed in the UK and introduced in 2014. 'Rhubarb and Custard' is a non-evergreen plant which is easy to grow in a container or in a border.